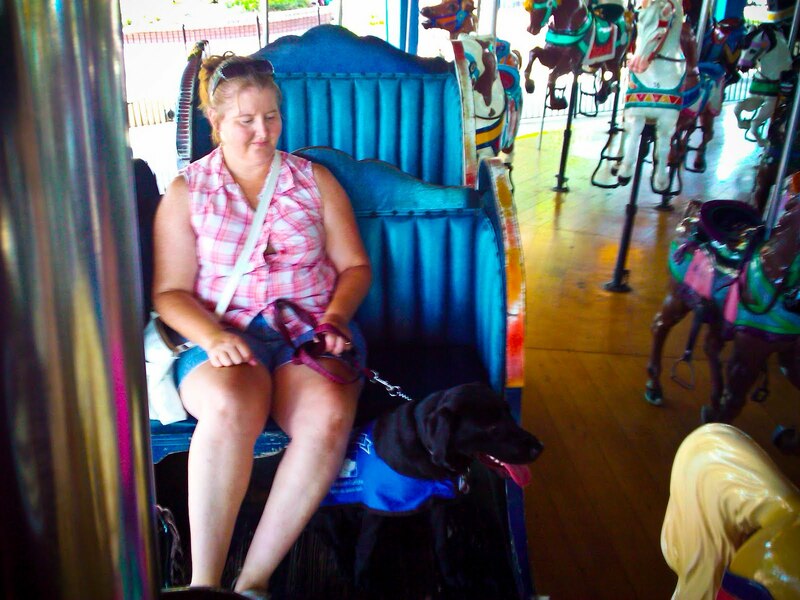 We're always on the lookout for new and exciting exposures for our guide dog puppy. 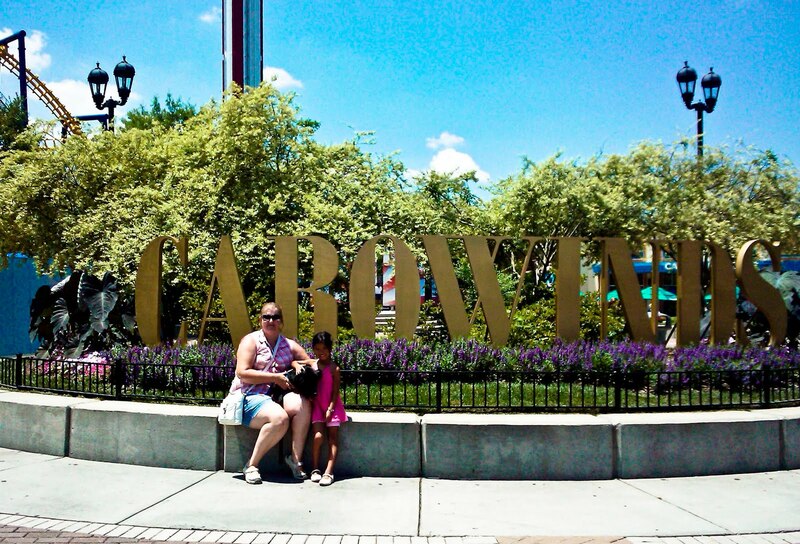 This morning after L had a Turns and Leaps "intensive" class at her ballet studio, we whipped out our season passes for a short trip to Carowinds with Cindy Jae. After a confused security person tried to wave us off to the kennel, he was quickly corrected by a supervisor that we obviously had a service dog and they allowed us right in with smiles and questions about the program. A quick stop at the guest relations window confirmed that Cindy Jae could go on two rides - the Sky Tower and the Carousel. And we were off! 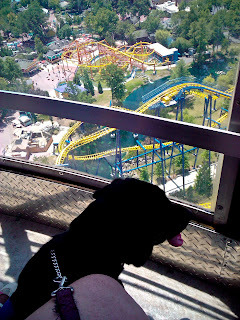 We rode the Sky Tower first and she did beautifully, walking all the way around the benches and sitting quietly watching us rotate through the air. 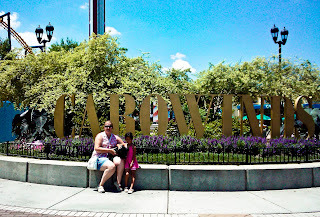 Cindy Jae was not a fan of the hot pavement, but thankfully Carowinds is very well-shaded with huge trees everywhere. We spent our time walking quickly from shady spot to shady spot with frequent water breaks. She met Charlie Brown and Lucy in their massive costumes without the slightest fear or hesitancy. We got on the carousel and settled down on one of the sleighs where Cindy Jae could see the horses. She did awesome there, too, in a sit-stay while watching the girls bob up and down on their horses. She got to experience getting splashed a little by the big wave off Whitewater Falls and was so incredibly thankful when we settled down in the air-conditioned theater to watch an ice skating show. It was so neat to see a stage covered in ice and the skaters were very, very good. 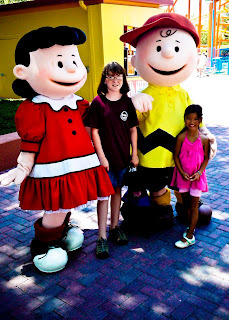 By the very last number, Cindy Jae had finally cooled down enough to get interested in the show and watched the big characters and the tiny dancers in their big finale. By that time, we figured she'd had enough of the heat, humidity, and hot pavement and we made the long trek back to the car by walking through the grassy median. That puppy came home and collapsed and I don't think she's moved since. Neither have any of the rest of us.